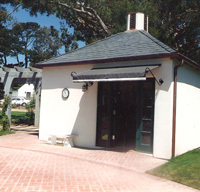 The Tennis Pro's Office is a relatively small, but carefully detailed stucco building that is consistent in form and materials with the country club's other vernacular structures. 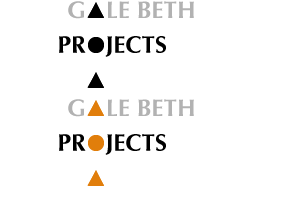 The natural slate roof and copper gutters add handsome texture. A wooden trellis with shaped columns and beams provides welcome shade along the pathway to the gazebo whose framework design echoes the form of the tennis pro's office and has seating for observation, conversation, and contemplation. 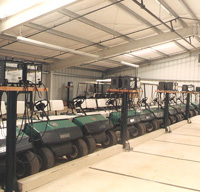 The Golf Cart Storage and Maintenance building consists of two levels that take advantage of the existing change in ground elevations: the golf carts are at grade and easily accessible at the upper level, and the maintenance equipment is housed on the lower level. 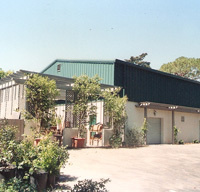 The building is a steel manufactured structure with the additions of wood trellises designed for exterior shading.